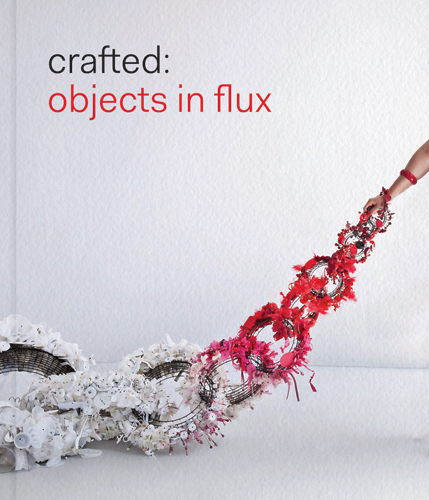 Crafted: Objects in Flux | Purchase a copy here. Contemporary art and craft presents a profusion of paradoxes. It bridges ancient traditions and state-of-the-art technologies, cutting-edge concepts and enduring tenets about skilled making and beauty, and in so doing blurs the lines between art, craft, architecture and design. This pioneering publication brings together work by nearly 40 international artists, whose varied approaches are not only pushing but redefining the boundaries of what we call craft today. Author Emily Zilber investigates the role of new tools and materials, the connection between craft and performance, and the power of craft’s interactions with space. Along the way, readers encounter a diverse group of works across a wide range of materials and practices, including 3-D printed ceramics, a dancelike performance with molten glass and a piano deconstructed to form jewelry that can surround or adorn the body. Enhanced with approachable text and abundant illustrations, Crafted invites readers to explore these stunning and surprising objects in flux.